This space, the opening bullet in your traditional TWER game preview, has always been reserved for a different kind of analysis. It was here, to open every preview to every game, that Jerry would offer us something that I always felt was essential to any kind of discussion, debate, or preview of a sporting event. It was here, prioritized above all the statistics, all the logistics, all the gut feelings, and all of the X’s and all of the O’s, that he would tell us, in short, what was at stake. He’d tell us the standings impact, the rankings impact, the pride that was on the line, the glory that was on the line. Basically, before the game was played, he’d tell us why the game was being played. Earlier this season when he stepped aside (i.e., was promoted) I wanted to keep with his same format in these weekly previews for the sake of consistency and for the sake of efficiency. Today, however, I will not be able to do that — at least not in this first all-important section. Today I won’t be able to report to you what will be on the line in tonight’s game. I can’t tell you what will be won or what will be lost — not for Auburn, and not for Oregon. I can’t say how important this national championship game is. It’s not because I don’t know, because I do. It’s not because I can’t find the words, because I could write book after book on the subject. It’s not because it’s too obvious, because it isn’t. The truth became increasingly clear during the month-long buildup to this game and to this day. The truth is that the magnitude of this game, and the true meaning of this game, is as varied and as different as we are people. I won’t be able to tell you what is at stake in this game, because the answer is different for you than it is for me, and for anyone else, and that is the truth. For some, this is the hottest ticket in the history of sports in the United States. For others, this is the most anticipated football game in recent memory. For some, this game is going to define the future of college football on-the-field, when the spread attacks it exemplifies changes the landscape of American football. For others, this is the game that will define the future of collegiate sports off-the-field, as a centuries old program called Auburn University faces a corporate-built brand called The Ducks. For some, this is their last time to put on shoulder pads, and one final chance to play with their teammates, their brothers, in the game of football they have so loved for the first twenty-two years of their lives. For others, its their chance to win a championship. And for some bright young fan out there, this is the game that is going to change everything. And for some old sage somewhere, this is that same excitement and magic that this sport has created for decades. For some, this is the national championship. For others, this is the national championship. I can’t tell you which it is for you. In fact, after 2004, I can’t even tell you if the national championship is the national championship. Maybe for some graduating student on campus, the end of the game tonight will be closure as they move on to bigger and better things in the world, and maybe for some ardent alumnus it’ll just be on to the next one as they jump online after the game to check in on recruiting. I don’t know what this game means to you or to anybody else, but after 37 days since the SEC Championship Game, after 37 days of buildup, waiting, and thought, I know what this game means to me. And after 37 days, you know what it means to you. You know what’s truly at stake. Oregon’s breakneck no-huddle offensive attack, which you might have heard something about, is directed by quarterback Darron Thomas, a redshirt sophomore from Houston, Texas. Beside him in the shotgun is speedy Heisman finalist runningback LaMichael James, also a redshirt sophomore, from Texarkana, Texas. James is complimented by his backup, redshirt sophomore runningback Kenjon Barner, and Thomas’s favorite target is senior receiver Jeff Maehl. Oregon’s offense is a true spread, in every sense of the word. The way they attack is with quick swing passes to receivers in the flats, and with gadget runs to get their backs into space on the outside, all while the threat of the read option lies in the inside. They’ll also use quick quarterback sprint-out runs to utilize Thomas’s speed, and passes with similar rolling pockets that narrows the field for Thomas and makes his decisions easier. And when the short stuff lulls you to sleep, and the no-huddle wears you down, they hit you over the top with the deep ball. Ted Roof and Auburn’s defense can play the Oregon offense in a number of ways. One approach they can take to slowing them down is keying in on Darron Thomas. It’s risky to allow a lane for LaMichael James on their read options, but getting after Thomas on his runs and making him work for his yards and making him run on passing plays can eventually wear him down, and when his legs go, so too does his passing. Getting in his face on passing plays can force him into making the wrong decision, and Auburn certainly has the front four that can do that. 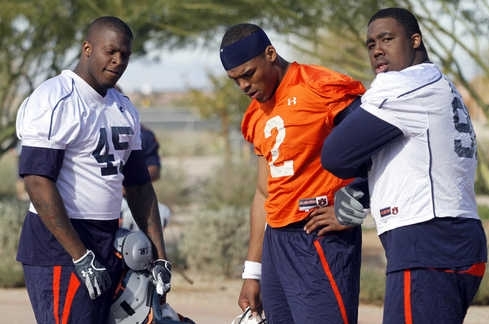 Another way Auburn can counter the Oregon attack lies mostly with their personnel. I detailed a little in the Iron Bowl preview how the play of Daren Bates at linebacker could counter the lateral movement of those quick passes in the flats that ate the Auburn defense alive against Kentucky and Clemson earlier in the year. Bates, the converted safety, could have the same impact here, but it depends on how Chizik and Roof will want to play. In the Iron Bowl, they opted to play Eltoro Freeman at that spot, and focus on stopping the run. Here, they could play Freeman, the sure tackler, to slow down Oregon’s inside read option, or they could play Bates, to help fly to the ball when it goes to the outside. But, for Auburn fans, the most dreaded aspect of Oregon’s attack is their deep threat, against the Auburn secondary that has been susceptible all year. Luckily for Auburn, Oregon doesn’t have an Alshon Jeffrey, or an AJ Green, or a Julio Jones, or anyone that will be a terrible size mismatch against anyone in the Auburn secondary. The phrase this whole month leading up to this game has been “Not stop, but slow down”, and that’s the exact approach the secondary will have to take here. They’ll have to play smart, take advantage of their turnover opportunities, and play hard on every single down of the game. Luckily, this secondary, with a season of experience and don’t-look-now-but-kind-of-gelling together, is in position to do just that. With all the talk about the offenses leading into the game, you probably haven’t even heard much about the Oregon defense and what they bring to the table. They run a base 4-3 formation, but I’m sure you won’t be surprised to hear that they do it in an unorthodox way. They utilize their speed and they like to throw several different looks at the offense, especially up front. They can give a three-down-linemen look and stand an end up on the edge, to reap the benefits of the 3-4, and they can sit their linemen back and drop a couple into coverage in some of their pass blitzes. But what they have in versatility, they lack in size. One thing Auburn might be able to do is roll over them in the running game on the backs of those big offensive linemen. However, the veteran Auburn line will only be able to push them back after they find them. The O-line struggled in the run game late in the season against the 3-4 fronts of Georgia and Alabama, and most of that was because they were missing their blocking assignments. Oregon, while they run that familiar base 4-3, will still throw a ton of different looks at the O-line. Hopefully for Auburn, the month-long layoff was enough time for the O-line to get their assignments down pat. In pass defense, Oregon runs a lot of zone schemes, which is something that Malzahn’s offense feeds from. 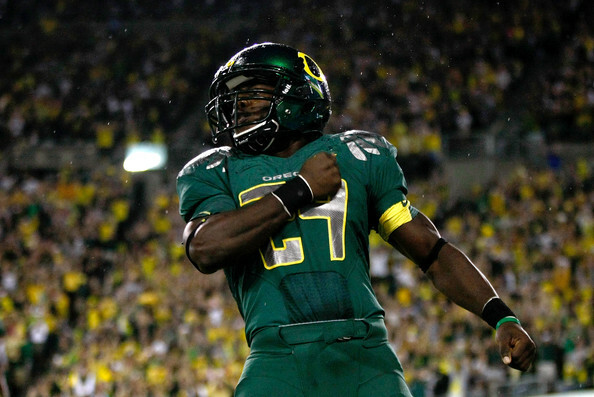 Oregon will have to pick their poison, as most teams have when they’ve faced Auburn this year. They can bring the heat on Newton and leave the underneath open, or they can try their luck with their four man front to try to get to him before his deep target gets deep. It will be up to Cam to make the proper decisions and to take whatever it is the defense is giving him. And whenever Oregon is in that zone and limiting their safeties, look for Mario Fannin from the backfield or David Carr from the slot to slip out and see if they can catch the deep ball. Grinding the clock in the running game might not be Coach Malzahn’s favorite thing to do, but there might just be an opportunity to do just that against this defense, keeping the ball out of the hands of the Oregon offense as much as possible. But if Oregon locks in on the run early, Auburn’s going to have to get back to passing, just as they did in the final three quarters of the Bama game. It’s unclear whether the running game or the passing game is going to be the key to success for the offense in this game. Luckily for Auburn, they have a certain Heisman trophy winner that can do both. 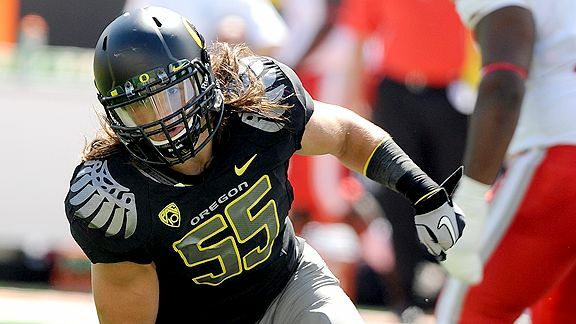 Oregon is lead on defense by their version of Josh Bynes, senior linebacker Casey Matthews, their top tackler. Their sack leader is senior end Kenny Rowe. Their athletic sophomore corner Cliff Harris has five interceptions. I’d tell you who has the advantage in the punting game, but no one really knows. Oregon has only punted 12 times this entire season. Auburn has only punted 13 times. The aforementioned Cliff Harris is Oregon’s top kick returner, as he’s housed four punts this year, but has had a fumble problem and his role has shrunk on kickoff returns accordingly. Backup runningback Kenjon Barner is their other returner, and he’s no joke either, as he’s returned a punt for a touchdown earlier in the year as well. Auburn’s going to have to do whatever it takes containing Oregon in the return game, because we all know that Oregon’s offense doesn’t need any help putting points on the board. There’s not very many kickers in the country that I would take over Wes Byrum, and Oregon’s sophomore kicker Rob Beard is no exception. He’s 9 for 12 on the year, with a career long of 42 yards. Advantage goes to Auburn and Wes Byrum, the greatest kicker in school history, one last time. The long layoff leading up to this game has been overly debated, but while both teams face the same effects, one dynamic that will favor Oregon is the disruption of all momentum that was had late in the season. Auburn was rolling to end the year, with momentum coming off the Iron Bowl and clear through the SEC Championship Game. Meanwhile, Oregon was in a tiny bit of a slump and played some of its slowest ball to end the year. This break ended all the good momentum that Auburn was rolling on, and ended the downturn that Oregon was facing at the end of the year. Auburn has been through a whole heck of a lot this season, and the juniors and seniors on the team have been through even more. And when you go back and look at it all, it’s almost like every little thing — and every big thing — is going to have them prepared and ready for anything Oregon could possibly throw at them. Auburn is not going to be thrown off their guard and they aren’t going to be knocked off their feet. If they’re going to be beaten, it’s going to be straight up. 1. Play until the end. Much has been made leading up to this game about Oregon’s ability to finish strong and pull away in the second half. But on the flipside, Auburn isn’t the only team that knows how to come from behind either. Early in the season, Oregon was down 21-3 to Stanford at the end of the first quarter. They ended up winning by 21. Auburn can’t afford to let off the gas for one second this entire game — not when they’re behind, and not when they’re ahead. 2. Take advantage of turnover opportunities. Any stop is a great stop, and the Auburn defense can’t afford to let any fumbles squirt away or interceptions slip through their fingertips. When the ball is loose, they need to pretend that that pigskin ball is the diamond one they’re playing for, grab it and not let go for the world. 3. Go out with heads held high, regardless of what happens in this game. What a year it’s been. What a year. I’ve said from early on that Oregon is the best team in the country this year, and it’s not close. I’ve said that they’re the best team that college football has seen since 2005 Texas. Their speed and athleticism is unmatched, while their coaching and preparation is masterful. I’ve been cheering against them all season, because I didn’t want any part of them. I didn’t want Auburn to have to play Oregon. If anyone was going to derail Auburn’s dream season this year, it would be Oregon. But over the course of this season, I’ve learned something. That something is that no matter what you do, no matter how well you play, no matter where you play, no matter how big of a lead you have, no matter how good, how talented, how hard-working, how fast you are, no matter what you say, no matter what you write, no matter what you report, no matter if you take them to overtime, no matter if you play them twice, no matter what songs you play in the pregame, no matter what you do, you cannnot and will not stop the 2010-2011 Auburn Tigers, and no matter what you do, you cannot and will not beat them. It can’t and won’t be done.